I’m a sucker for the unusual. A simple boy-meets-girl story isn’t always enough to keep me interested; girl disfigured with an axe blade to her face, on her way to see a faith healer? And it’s a musical set in the 1960s? Now we’re talking! The show I’m speaking of is Violet, based on the short story The Ugliest Pilgrim by Doris Betts, and it is a musical with music by Jeanine Tesori (she just won the Tony for Fun Home and also did Thoroughly Modern Millie) and book and lyrics by Brian Crawley. In the show, Violet is a woman living with a scar down the side of her face from a childhood accident, and she is traveling from North Carolina to Oklahoma by bus to visit a faith healer she saw on television with the hope that he can rid her face of the disfigurement for which she has been ridiculed and ostracized. If it sounds like an unconventional premise for a musical, that’s because it is; it’s also so much more, examining how we all have lives marred with scars that we have to come to terms with – Violet’s just happens to be on her face. Violet premiered off-Broadway for a brief run in 1997 that produced a beloved cast recording; an acclaimed Encores! Off-Center one-night event in 2013 led to the 2014 Broadway premiere starring Sutton Foster, for which another cast recording was made. I saw the 2014 Broadway production and had mixed feelings about it, though it was well-reviewed and nominated for many Tony Awards. Seeing it live didn’t affect me the same way as listening to the initial cast recording did, so I was excited to get the chance to re-evaluate the show at the Porthouse Theatre as part of the Kent State University summer season. This was my first visit to the Porthouse Theatre, a lovely outdoor performance space that is a part of the Blossom Music Center in Cuyahoga Falls, a pleasant drive around two hours from Columbus. I was a little surprised to find that the show was being performed outside on such a bright and sunny (and hot) Sunday afternoon, but the theatre is constructed on the side of a hill with the seats descending stadium-style to the stage at the bottom. I found it quite comfortable as the seats on the padded, backed benches were roomy, and the audience and stage were sheltered from direct light. It was like viewing theatre under the shade of a large tree with the breeze flowing and birds chirping; I can only imagine how nice it would be to see a show here on a crisp evening. The grounds have many picnic tables, ample free parking, and a nice concession area for drinks and treats. 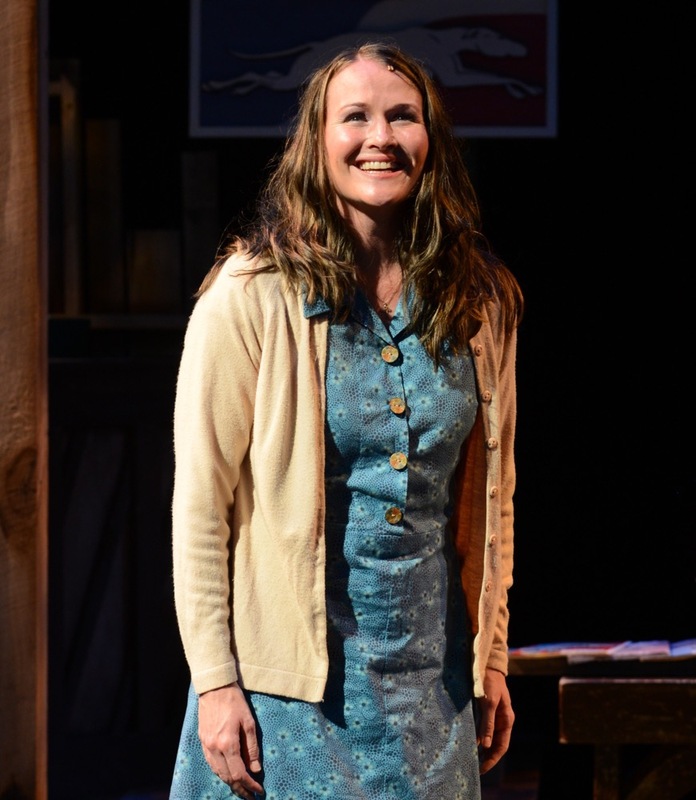 Amy Fritsche plays Violet, appearing in her first Porthouse Theatre production during her summer off from teaching theatre at Kent State University. With facial structure that brings to mind Ann Todd and Laura Linney, Amy acts wounded well, appearing emotionally calloused from years of taunting even though in reality she’s a gorgeous blonde. As on Broadway, the scar is not represented by makeup but rather by the reaction people have to it and Violet’s own words. As Violet, Amy doesn’t scowl and act gruff like Sutton Foster did on Broadway, but that’s because she doesn’t have anything to prove; Sutton had to show she could play more than the peppy ingenue after Tony wins in Thoroughly Modern Millie and Anything Goes, and I think that pushed her performance in Violet too far in the opposite direction. Amy isn’t afraid to smile at a joke or greeting, and she is more vulnerable and reachable as a result. Like Sutton she comes off as a bit too intelligent to believe that a faith healer could suddenly heal her scar when doctors couldn’t; unlike Sutton I didn’t feel like her emotional dukes were up to the extent that she couldn’t be reached. It’s always thrilling to see an actor go on a journey in a role and grow, and Amy makes Violet’s eventual epiphany heartbreakingly honest and touching. Jared Dixon plays Flick, the black serviceman Violet befriends along with his buddy Monty, played by Ian Benjamin. Jared is likable and sweet as Flick, and I believed his interest in Violet was coming from a place of mutual understanding. Ian is perfectly cast as Monty, an immature young serviceman who talks big thinking that people will take to him better for it; the part was played on Broadway by a pretty-boy type far beyond the age for which the part was written, but Ian has the fresh-faced look that is just right for it and the slight awkwardness of youth that the part requires. Both men sing quite well and drift in and out of verse with ease. Dane Castle and Talia Cosentino play Violet’s father and the younger Violet, respectively, in flashbacks and dream sequences. Dane is caring but reserved as the father, and his bearded, broad mountain man look helps to hide the guilt and concern he has for his motherless daughter. His affection for Talia feels real. What Talia lacks in resemblance to Amy she makes up for in heart; her eyes are extremely expressive and warm, and I enjoyed seeing her come back onto the stage for each appearance. The smaller roles are also extremely well cast, and many of the actors play several parts. Allisyn Just plays the old lady with verve, looking like a more mobile Thelma Harper from Mama’s Family; as the hotel singer her sterling voice, sly grin, and beautiful teeth are on display, as well they should be. Shamara Costa as the landlady is someone I wouldn’t dare cross, quick and sharp, shifting gears completely to sing effectively as the gospel soloist. Paul Floriano doubles as the bus driver and the preacher, the latter part he grabs and runs with, appearing like the perfect religious zealot working the crowd. What I liked about director Steven C. Anderson’s production of Violet is that he has found a way of presenting the story simply on such a relatively small stage. Characters often appear walking around the perimeter of the theatre and then enter the performance space walking down the aisles where the audience is seated. The flashback and dream sequences are staged in a way that spells out exactly what they are, while on Broadway I was sometimes confused. An intermission has thankfully been added at an appropriate place, and the events of the story play out at a brisk pace while not feeling rushed. The gore hound in me would’ve liked more realistic blood and makeup in the flashback to Violet’s accident, but that’s a pretty minor criticism for such a strong production. While I think Violet is slightly over musicalized (there is a lot of recitative when regular dialogue would’ve more than fit the bill), I found a new appreciation for the show in this production. Violet’s inner and outer journey is easier to understand and embrace with this team of talented performers behind it, and it is a show that only improves in its second half (quite unusual in my experience). The show is worth seeing even if one only saw the last few minutes when Violet learns how to let someone in to love her and give love in return in her relationship with Flick. Whether or not their interracial relationship would last in such a troubled time isn’t as important as the fact that Violet, by way of her pilgrimage, grew emotionally and would never again be the same untrusting, closed-off person that she was at the start of her journey. This is the kind of theatre that is touching without being preachy, the kind that shows feelings rather than tells about them. The Porthouse Theatre production of Violet demonstrates what theatre is all about, and my only regret is that I only got to see this incarnation of the show once. My friend Michael Nalepka and I at the Sunday matinee of Violet.